Don't look at my bad clouds. ._. 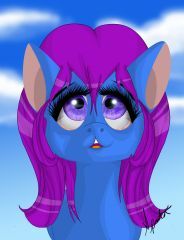 Anyway, I decided that I wanted to work on the pony version of me and decided it was an opportunity to try some new stuff out. I like it for the most part. Frustrated scribbles are frustrating. I wanted to draw how I think Sweetie will look in her later years. I hit a major block at her head and just couldn't get any eyes to work for her. I originally wanted a 3/4th view of her face, but she flat out refused. That's when I realized I've been totally inconsistent with my eyes, and they've been the weakest part of my work recently. My so far best piece (in my opinion) looked good because her eyes were CLOSED. Just when I start to get the body down, some other body part decides to throw a wrench. All part of the learning process I guess. Maybe I should go stalk Solar-Slash. His pony stuff is like, 80% big soft eyes. I went with the one that's closest to the show for this one, but I dunno... I'm still trying to find my own style. 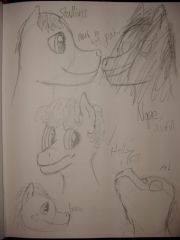 Something people can look at and say "Oh yeah, Kryptchild drew that!" the first time they see it. My head is probably too far in the clouds right now, but part of why I look up to artists like Joey-Darkmeat, John Joseco, Speccy, Madmax, Jitterbug, Solar, Will, Slugbox, UC77, and Egophiliac is they're not just recognizable names, but the have recognizable art styles. They own how they create, they're consistent... and it's my goal to graze my fingers across the bottom of the clouds they sit comfortably atop. I really like her mane. 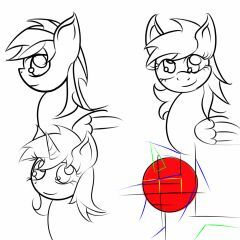 okay... so I tried using the pen tool in my making of ponies in Photoshop, and I think it actually turned out really well! I decided to make a couple of different bodies, even though all of them are pretty similar, just to experiment. I then decided to number them and ask which ones were your favorite, because I knew a bunch of ponies on here would probably have really good insight and advice. Personally, I like 5 and 6 the best. 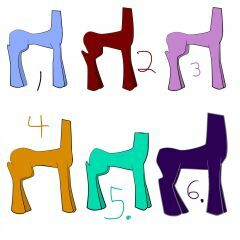 6 is more of a stallions body, and 5 is neutral... but anyways, please tell me which ones you think came out best! Any advice would be appreciated! Back legs have been giving me some serious trouble lately.,,, Why must something so simple be so complicated?!?!?! GAAAAAAHHH! 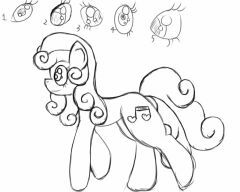 I've got like, four tutorial images on back legs alone, and I still mess them up! I mean just LOOK at those! Pharm would strangle me for drawing him with those misshapen thighs... I'm going to bed.